In this post I want to explain how Nginx overcomes Apache. Even Apache is the most popular and widely used web server in the world; Nginx is the main challenger to Apache. Apache can only process 100 http requests per second and is not efficient in websites that face heavy traffic. Nginx can process thousands of http requests per second and can easily handle more than 500 million requests per day. Here I want to show you some statistics which are shared by Joe Williams, an open source supporter. 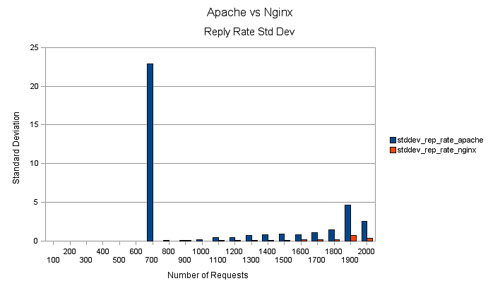 The image given shows the reply rate of both servers. The reply rate is the rate at which the servers reply to the http requests. 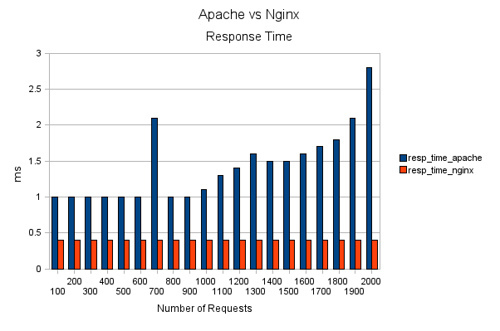 It is clear that Nginx takes less reply time than Apache that makes the nginx server a fast one. Another statistics is about the network I/O overhead. 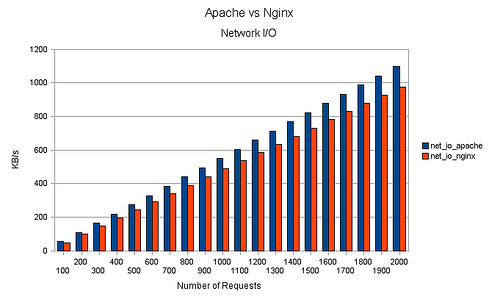 Apache uses more bandwidth to handle the same number of requests that are handled by the nginx. Another interesting statistics is on the response time. Look at the image given below. Apache has higher response time and it varies upon the increase of number of http requests. But nginx shows a constant 0.4ms response time throughout the varying number of http requests. Nginx also overcomes Apache in the case of load on the CPU. In my next post I will explain how to install this powerful web server in the ubuntu systems.